After traveling all week, I didn’t feel like hitting the grocery store when I got home last night, which meant no apples or bananas for my usual oatmeal. So I got a little creative! This combo takes like a delicious PB&J, but even better because the berries add so much flavor. 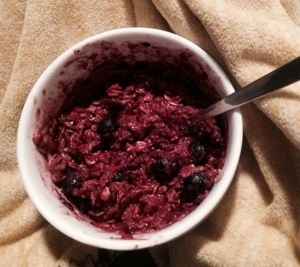 1) Add oats, berries, and water to microwave-safe bowl. Put oats on the bottom of the mixture. 2) Microwave for 1:00-1:30. Take out and mix together. 3) Add PB2 and Truvia, and mix until thick, then enjoy! It’s Officially the a Holiday Season: Show Me your Sweaty Selfie and Win! This recipes sounds very yummy. I always have frozen berries for my smoothies. I’ll have to try them in my oatmeal. That looks delicious! You use powdered PB because it’s easier to mix I assume? I’ll have to get some. It’s easier to mix and it takes most of the fat out, so it brings the calorie count down too. Sometimes I’ll add other nuts to add some good fat back in, but there’s mixed reviews on peanut oil being a good fat. Nice! A little lower in protein than a serving of regular PB but not bad given the much lower calories. And, I have to say, I will have a hard time resisting trying the Chocolate PB2. I haven’t tried it, but I’ve been adding it to my chocolate protein powder and it is amazing! This sounds so good! I love a peanut butter/oat combo and the berries are an added bonus! I will do PB2 and oats with jury about anything. It does not work with pumpkin though. Not a good combo. Oooh that sounds easy enough, I could totally try this. Thanks for sharing! It is so yummy, and easy!